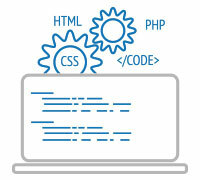 EXE provides a wide-range of software development services that is most suitable for business needs. Our portfolio of Software Development includes website and application development, information system solutions, mobile app development, interactive user-centered design, and more. We always quickly deliver innovative solutions that satisfy the highest requirements of every client at a reasonable cost. Furthermore, we commit ourselves to taking our clients’ perspectives in order to completely understand their business concerns and accompany them in the process of ensuring the effective functioning of the product, eventually making it flourish in the market.